There’s one thing having a whole bottle to study, as opposed to [sometimes inadequate] miniatures/sample bottles, but to have three bottles from the same cask - now that’s an opportunity to truly get inside this thing! N: I remember my first impressions of this were most favourable [Blog86], with subsequent visits somewhat diminished. I’ve now come full circle - I’m a total sucker for this one, and rightly so. I won’t just give yet another shopping list of stuff because really this is all about combo magic, the whole lot bound up and in it together - namely a rubbery/waxy>creamy<sulphury sweet petroleum, earthy vegetal-oily musty-malty spicy-sweet thing. Super stuff, compliments to the chef! Though it appears at first to be all-sherry to the point of hilarity, that’s not where this story is at all. It can and does indeed transcend it’s heavy [oloroso] inheritance. Within the recipe I pick out lardy cake, Smiths Cheesy Moments, raspberry/tutti-fruity coulis and vibrant [truffle] oils to drool over. A great example of where high abv really pays dividends. And yet there is a fabulous soft-coppery barley spirit at the core. T: Whilst I’ve found the sherry influence to be utterly outrageous in the past, it doesn’t seem so detrimental now i’m fully inside my third [and last] bottle - I know right, a sucker I tell you! Soon all is well when the malty/oily/vegetal sweetness hits the chew. Even though it seemingly couldn’t be more sherried, there’s something distinctly different here compared to other direct sherry-delivered bombs. The sulphury sherry has a vegetal quality that’s more akin to a rum<malt complex given all that waxy vegetable tannin around. Keep going with it and the sherry ‘boing’ is now only the most minor of distractions. Mouthfeel and flavour combos rule this roost. Not once are you concerned about age, immaturity and even balance - once you’ve let go [analytically perhaps]. The chew goes on with sherried tree-rubber and waxy/creamy, vegetal vanilla cream. F: Petroleum and rubbery-malty-waxy raisins moving slowly into guar gum and raw chocolate with macha. Rice paper-dry. Later on, occasional waves of rubbery sherry are met with a putrid/sick note that passes by - but it’s the waxy malty>fungal>vegetal chew that remains. Not bad, very good for 8-year-old mole, and if it's also Tullibardin, then just a fantastic success, very tightly, well balanced, of course, no complexity and depth, but the saturation, power, already formed character, it all captivates, and just tasty. Open, moist, the first nose - wine notes with a varnish and impregnations of a radish; a lot of sweet raisins, freshly planed boards, light shades of the barnyard yard, raw wool, pale leaves, moccasino, chocolate-nut paste, in the background lemon peel with lollipops, a few spiny mineral inclusions. Powerful, rich, sweet raisins, oak, a bit of tart young bark, a wave of red pepper, a little cinnamon, cocoa, nuts, dark chocolate, ginger candies, creamy notes, some tropical fruits. Spicy, warming, moccasin, nuts, caramel, oak, a little burnt biscuits, very soft. There was some confusion, at least on my part [as per usual] over what distillery this was from. I thought id heard it as distillery #8 not #28, neither of which are seen much as SMWS bottlings though I believe the SMWS haven’t seen Tamdhu since 2006 WB – no wonder they had none in stock when I enquired. SMWS Tullibardine are similarly as infrequent however, there being only 33 bottlings since the late 70’s/early 80’s. N: With only one sniff and I had indeed joined the dark side. 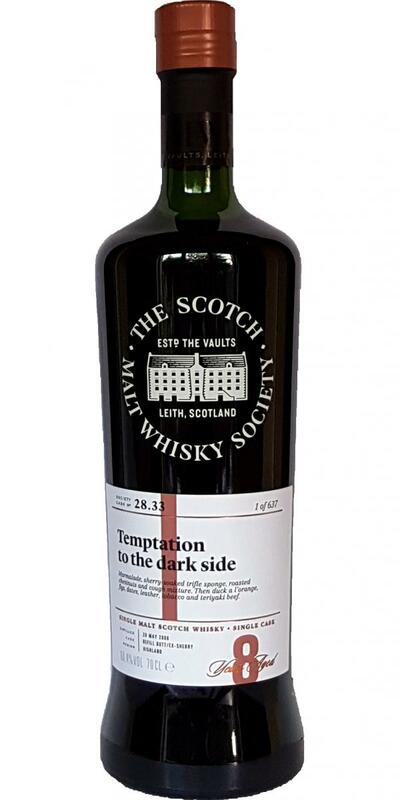 I was detecting notes of chocolate raisins, leather, roasted & honeyed pork, dark/deep sherry & black cherry with a heavy maltiness and vibrant armagnac notes (dark grape-skin tannins) – all presented in a youthful cask, a winning combo here. Intoxicatingly stuff. T: Thankfully, it delivers on the palate as hoped. Add a little water for a waxier, dryer malt. F: A salty malty chocolate finish.